Lets face facts here - anyone who predicts something for their business five years out is, is predicting science fiction. Noone can really see out more then two years, possibly three at most, with their organizational investments and intentions. Simply put, most major enterprises still believe they have mileage in the traditional labor arbitrage model. There is clearly an absence of a burning platform—or capability—to drive change in the foreseeable future. Our research found two exceptions: healthcare and life sciences organizations that have exhausted this model, and enterprises under $1 bn. Small and mid-sized enterprises (SMEs) are often less resourced and with fewer opportunities with the labor arbitrage model, having less operational scale. What is truly worrysome here, is the speed of change in today's global environment and what could happen to many of the organization simply paying lip-service, when it comes to hauling their antiquated back offices out of the dark ages. And, heaven-forbid, we are struck by a renewed global downturn, with so many of our enterprises failing to adapt to the modern business environment. Last time I checked, worrying signs are emerging with the faltering Chinese currency and European basket-case economies seeking to go beyond being basket cases (a phase for which has yet to be coined). 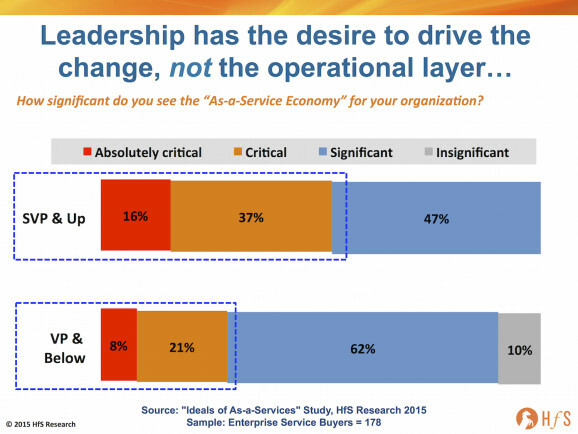 One of the biggest obstacles to enterprises achieving progress towards achieving As-a-Service Ideals, is this huge delta between the desire of operations leadership to make the transition and the lethargy of the middle management layer. If this gap cannot be closed, there will eventually be ramifications for many enterprises which will see their competitiveness slip away due to an overly complex, expensive and inefficient operating model. People’s careers need to be aligned with where the industry is going – not where it has languished for many years. What's more, incremental fixes clearly do not work – for all stakeholders. We have entered an economy where writing off legacy investments needs to occur for so many. 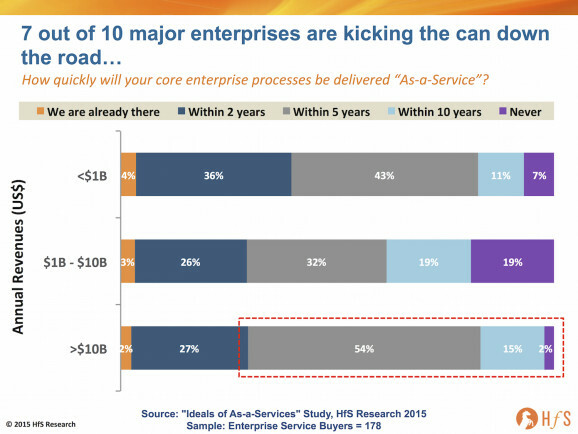 Just because an enterprise invested millions in a now-obsolete set of processes and technologies doesn’t mean that enterprises should been persisting with plowing further resources into them - there comes a point where money spent in maintaining the old is wasted, while investments in solutions that drive real outcomes have some ROI down the road. We need to reach that pivot-point where business leaders make real, definition investment actions to change their operations, otherwise we'll be forced into another recession-induced series of changes to many businesses, which are rarely driven by proactive decisions - but by reactive behaviors only designed to make quick fixes, not long term ones. No messing about here, Phil! The inertia in the middle management layer is very eye-opening. This is where the bottlenecks are from my experience: people with no incentive to change the model and want to keep things ticking over the same as always. @andy - the more middle management refuse to shift the model, the more frustrated leadership will become in many firms (we're already seeing this in several clients). Once the wiggle room for the next found of productivity gains is gone, the demand for new thresholds of value is appearing. 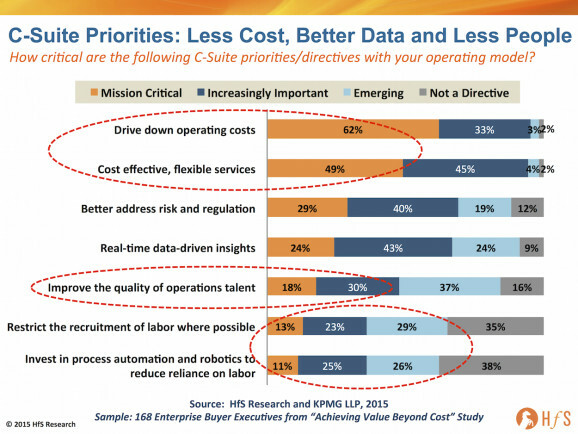 This is why RPA is so interesting to many firms right now, as it offers the building blocks to find new ways to remove inefficiencies. However, it only really has immediate impact in areas which have high throughput of processes with can he highly standardized, as RPA requires a lot of computing power and expertise to make work. Personally, I see the real benefits of automation and digital (eventually) coming from the service providers which do it on themselves and pass the benefits onto their clients. Middle managers who refuse to get with the program will quickly get exposed when the availability of As-a-Service offerings continues to proliferate. The global economy is slowing down, economies are staring at the prospect of deflation, hence enterprises will increasingly look at ways to simplify their operations and become more agile, scalable business in an unpredictable future economy. Outsourcing - as it was - may be leaving the building, but the new ways of As-a-Service is arriving with a different ethos, where the excuses have worn thin, as the desire for digitizing business processes and creating meaning data becomes king. Newton’s 3 laws of motion are clearly in work here. 1st law – Objects have a natural tendency of keep doing what they are doing unless an external force is applied on. All objects resist change in their state of motion. This explains the inertia of middle management i.e. not being able to change in absence of an external force. The desire from top leadership has to convert into an actionable push otherwise the inertia will continue. 2nd law – The force needed to change the motion is proportional to both mass of the object and the speed of change (acceleration). The new and agile start-up organisation are able to change easily and at a faster pace. For the bigger giants, the force (i.e. money) needed is much more. So how can you move fast, either cut flab or pump in more money. 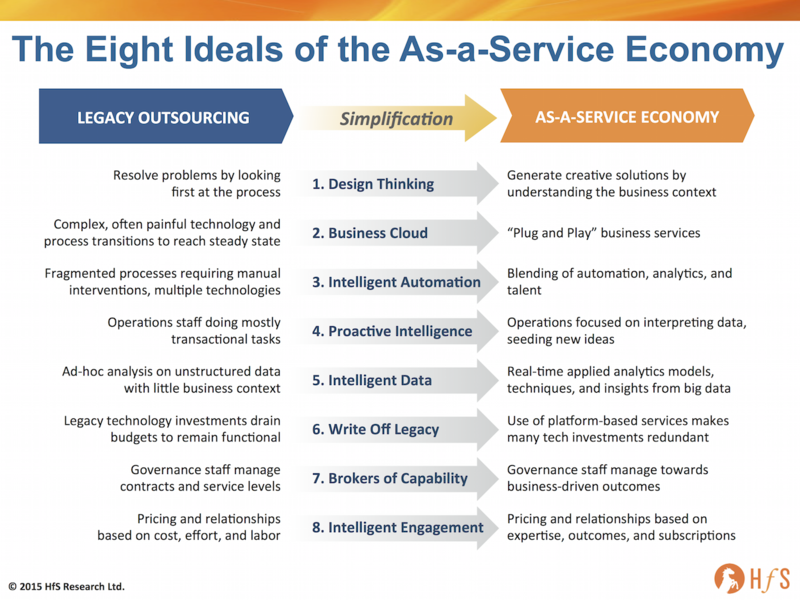 As-a-service economy allows you to do both at the same time. 3rd law – Every action has an equal and opposite reaction. Although not a perfect analogy but investment made in “As-a-service” economy by service providers/clients will have clear and visible returns due to fast changing global business environment. Great article. You'll like what I am going to post this weekend. I think you'll have the answer to a lot of your questions about inertia.